The following applications are representative of those adopted by many of our satisfied customers. We are not yet authorized to show some of them, but we will reveal more details in due course, and many applications will become public in the coming months at various trade fairs. Our customers’ markets include smart metering, building technology, agriculture, logistics, tracking and many more. Almost all wireless IoT applications that are covered in the news and media are included. We have concentrated on applications in the classical cellular M2M and in the SubGHz LPWA range with internal antennas because the antenna design is more difficult there. Of course, we have also developed Wi-Fi and Bluetooth antennas, but these are much easier to design compared to NB-IoT, Weightless, Wireless M-Bus and LoRa, because at 2450 MHz for WiFi and Bluetooth the frequency is about 3 times higher and the antenna and ground plane can conseuqently become 3 times smaller. 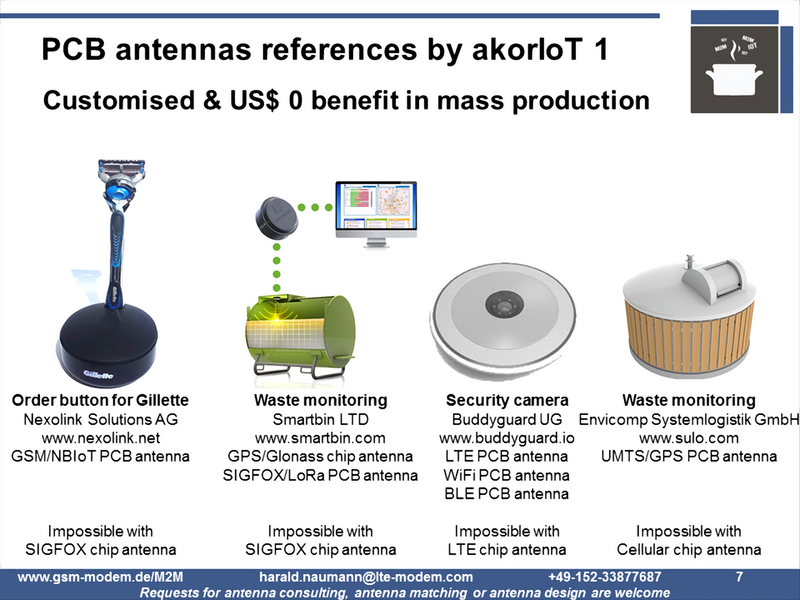 For Smartbin the team from akorIoT Group has developed various PCB antennas for GSM, UMTS, LoRaWAN, and SIGFOX. We replaced the off the shelf Helix antenna for LoRa /Sigfox of a well-known manufacturer with a customised PCB track antenna. The PCB layout has also been optimised. The PCB Track antenna shows much better antenna parameters than the Helix antenna. The positioning of the antenna on the PCB was carefully chosen and the track of the antenna was adapted to the round shape of the enclosure. After our design work, the communication range was much further and the bill of material cost was lowered as well. We delivered better functionality for lower cost. With the Buddyguard camera, we are the lifesaver in an emergency. The antennas for LTE, Wi-Fi and BLE were planned as standard flex PCB antennas. The camera has a ring of LEDs on the outer edge of the housing. LEDs need a mass layer to function. This mass ring was a short circuit for every Flex-PCB antenna of every manufacturer. No Flex-PCB antenna on the market could do the job. In this case, the team at the akorIoT group developed a multiband LTE antenna with coaxial cable and a Wi-Fi/BLE antenna with coaxial cable and placed it in front of the mass ring in the outer edge of the housing. The Buddyguard camera is a good example of how to design a beautiful housing with no awareness of antennas and radio wave propagation and end up with a design which cannot transmit a radio wave. A small investment in advice on choosing the antenna and space for the antenna does not cost much and saves you from nasty surprises in the form of project delays and additional costs at the end of development or tool making. Envicomp wanted various PCB track antennas for GSM and UMTS to optimize antenna performance. The special task was to mount one of the garbage cans below the Earth’s surface. The metal container, the underground installation of the antenna and the uniform housing with its mounting bracket were challenges that we mastered for this client. The waterproof GSM/GPS tracker has very small dimensions. The battery is charged inductively. The GSM antenna was designed as a rigid-flex-PCB. For GNSS a ceramic chip antenna was chosen. For Prothelis, models of the antenna were created using bent wire to determine the possible construction and to approximate the result. Such functional models are much cheaper than software simulations and represent the target much more accurately. Such models can be changed and measured in a few minutes. Simulations may take hours to calculate and will possibly show a useless practical result. After the simulation, you still have to construct and test the antenna and may only then find out that the simulation is wrong or far away from the target performance..
Pikkerton’s AAL system is installed in the flush-mounted box of a light switch. The chip antennas the customer planned to use could not do the job. The GSM antenna was designed as a custom Flex PCB antenna with coaxial cable connected to the motherboard. To emulate the real conditions a virtual wall was built. The wall plus the plastic housing and the ground plane of the PCB forms the antenna system. Without brickwork, the customised antenna is totally detuned. The picture of the antenna for Quantec shows a prototype as an interim step. In the first step, the standard PCB antenna with cable was exchanged for a customer-specific PCB antenna. The standard antenna did not work. The customized antenna solved the problem. The next step was to redesign the PCB into new multi-mode modules with a new cellular antenna at right angles to the motherboard. The GNSS antenna was designed as a chip antenna. For BFOM, a customized helix antenna for SIGFOX and NB-IoT was developed. The task was to find a compromise between installation space and antenna performance. The compromise was achieved after a workshop. Such workshops can be held locally at the customer’s premises or via Skype. A good preparation and feasibility study save high follow-up costs. At Findmy, the expensive GNSS patch antenna and expensive Globalstar patch antenna were exchanged for a PCB track antenna. Since Globalstar and GNSS are close together in the center frequency, the two antennas were combined into one with a switch. A matching circuit is necessary. The antenna was matched directly to 50 Ohm. Our redesign has a better antenna performance and is much cheaper to manufacture. At Chip45 the PCB antenna was matched as a piece of contract work. We were allowed to disclose the result and explain which steps would improve the construction. 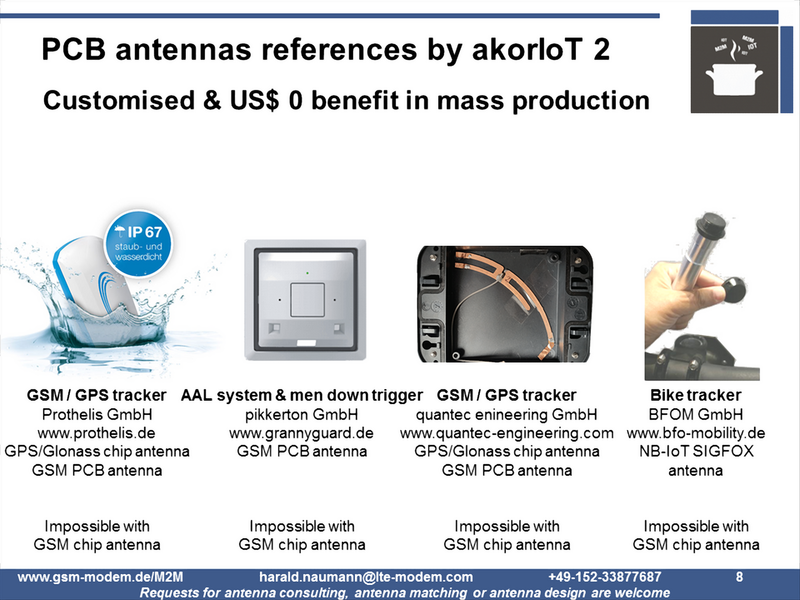 Matching of antennas is possible in the akorIoT group for all manufacturers. The process is described here. The article about the antenna for Chip45 can be found here. To build a sewer shaft is too complicated. This is why we brought our PC-based VNA from MegiQ and the laptop to the edge of the shaft and carried out the measurements. For Ayyeka we went to the DIY store to source gravel stones for a model of a road. An old bucket plus gravel stones – and your virtual road is ready. Has this article piqued your interest? Do you plan your own LPWAN IoT device? Do you plan to deploy IoT devices with embedded antennas? Do you have an IoT prototype and need to optimise the design or minimise the price? 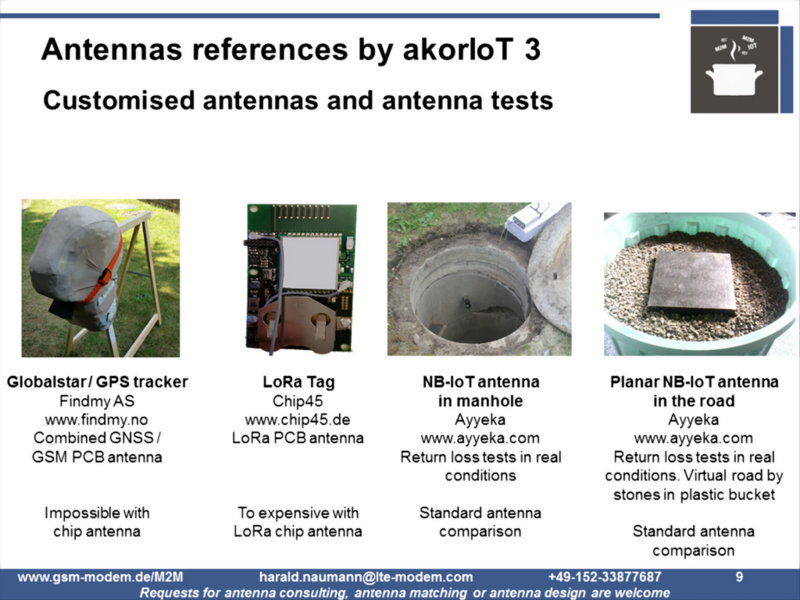 If you have answered YES to any one of these questions then please do not hesitate to drop an email to harald.naumann (at) lte-modem.com and to ask for a proposal or some engineering services to make your IoT idea a cost-effective reality.